September 19, 2016 – This week, our time machine makes a return visit to 1870s, to check back in on Union Pacific Railroad tycoon Dr. Thomas C. Durant, and his children, William and Ella. We first met the Durants when we chatted about Sheila Myers’ novel, Imaginary Brightness, as they had their comfortable lives in London shattered by a Gilded Age economic panic. Book 2, Castles in the Air, finds William Durant as the uneasy head of the diminished family fortune. As he struggles to restore it in New York’s Adirondack Mountains, Ella flees to London to pursue her life as a writer — and to be pursued by a mysterious French count (or at least he says he’s a count). 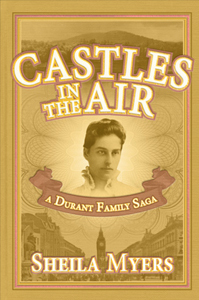 If you’d like to meet the Durants, you can pick up Castles in the Air for 2.99¢ on Kindle. You can follow Sheila Myers on Twitter @SheilaMMyers, or visit her at WWDurantStory.com.